Make your dreams come true on the stud farm near the old mill: renovate your own riding school, look after your horses and tend the cute little foals. As well as wonderful rides, working in the stables and caring for the horses, you ll have plenty of other exciting things to do! - Large estate with stables, riding arena, guest house, treatment centre, meadow and challenging routes to ride. - Breed cute little foals (over 100 possible combinations), train them on the lunge and then sell them to horse lovers. 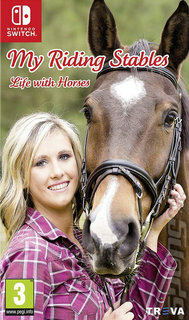 - Pamper your horses with curry combs, massages, showers and by cleaning their hooves. - Demonstrate your riding skills on challenging cross-country rides. - Gallop at full speed and handle the fabulous jumps on 9 riding courses and in the open. - Exciting horse races through stunning countryside. - Get up close and walk around the game units life size in the Quarpedia. Learn about their historical uses, stats and in-game abilities. - Comprehensive business section with the aim of running the best stud farm in the world.